Yeah, but: We can't all want Swiss Champs. The Long Version: I tried to use the Explorer, I really did. 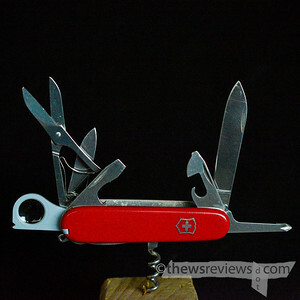 I've been reviewing a different Swiss Army Knife each month, which gives me a reason for a little variety in what I carry. But the Explorer is a thick four-layer knife, and it's just too bulky for me to like. I ended up carrying it in my backpack instead of in my pocket, and unsurprisingly, it saw very little use. The Explorer is remarkable for adding a really excellent in-line Philips screwdriver and a magnifying glass to the foundational SAK toolset. Large blade, small blade, scissors, can and bottle openers, corkscrew, awl, and hook – no nail file, but otherwise it's a very complete kit. The Explorer really is an iconic Swiss Army Knife. But aside from the magnifying glass, it doesn't have any core capabilities that the two-layer Compact doesn't have, and it even lacks a few tricks. Yes, the Explorer's dedicated openers and screwdriver do work better than the combo tool, but I carry a SAK for contingencies, not in place of a proper toolkit. The screwdriver really defines the Explorer for me. The Victorinox in-line Philips is vastly more useful than the backside driver, and it even has a ninety degree detent position, so it can beat the T-handle configuration for both power and ergonomics. Its asymmetric handle still isn't as nice as a proper screwdriver, but it really is usable for more than the quick turns that the backside driver or combo tool are good for. 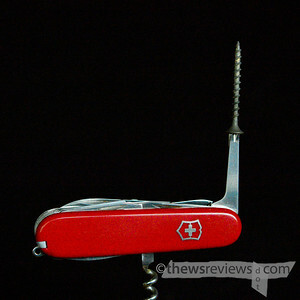 Those who like the bigger tools – anyone who aspires to a Swiss Champ – will be very happy with it. Having it kept my "I Own A Swiss Army Knife" checkbox ticked for more than a decade; I even bought two other large knives simply because that's the form factor that I always expected a SAK to have. Bought, but not carried, just like the Explorer. Even though I prefer the single and two-layer knives for everyday carry, It's still good to have the Explorer for the times when I need more than my Tinker but not something as heavy as a pliers-based multitool. Thanks for showing the Explorer. My favourite SAK knives have the Philips bit in line. M.E.C. carried them for years, but don't any longer according to a worker at the Burlington Store. This combination is so important to me that I keep a spare SAK handy. I'm lucky enough to have one of the rare Victorinox stores just down the street from where I live. The next time I want a new knife, but don't have a specific model in mind, I'll probably head in and see what's in stock with the LED light and in-line screwdriver combination. Thanks for your comments, including those about the V1. The one here is #750 for this site, too, which is fairly cool. I like what you do! I bought my Billingham Hadley Pro after reading your review. I had considered one for a while. I already had a Hadley Digital--check it out! It's an incredible little bag. May I say: www.rangefinderstore.com local to us, in Burlington. Business days I used an F2, then an F3HP+motor drive. Leica M3/M4P. That's long since past. I regret not getting into medium format, so I enjoy your talks about your endeavours. I've tried simplifying my life. Concentrating on "being there" but lightening the load. I've enjoyed my little N1V1. My Wife thinks I'm nuts. Her travel zoom is much better. But my, she takes great images! Yes, it's thicker than I like. However, it's a great every day carry SAK for me in spite of that. Thanks for your review. Reading it, I realized how much I like this SAK and bought a spare.